In a surprise reversal, University of Chicago Medicine (U of C) committed Thursday to building a Level 1 adult trauma center on its Hyde Park campus. U of C had a trauma center for adults from 1986-1988 but it closed after losing $2 million a year. Michael Reese Hospital’s trauma unit closed its doors in 1991, leaving surrounding communities on the South Side with no adult trauma center. Back in September, U of C and Holy Cross Hospital announced a partnership to offer adult trauma care at the latter’s Southwest Side location. But U of C hospital president Sharon O’Keefe said detailed planning showed the relationship wouldn’t work. “It became apparent that we actually couldn’t leverage those synergies,” O’Keefe said. O’Keefe said U of C plans to relocate and expand a new emergency room that allows the hospital to integrate trauma services. O’Keefe said she doesn’t know how many new beds will accommodate trauma victims and she doesn’t expect the hospital to lose money. Trauma centers take care of the most critically injured people; car crashes, stabbings and gunshots are the most common wounds. 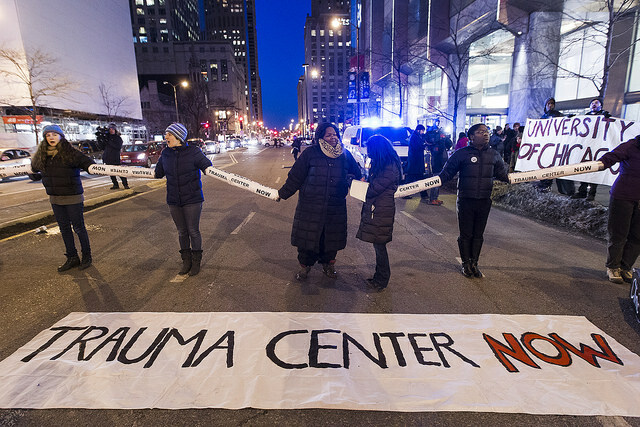 Chicagoans are currently served at six trauma centers: four within the city and two in nearby suburbs. Level 1 trauma centers have in-house, 24-hour care in specialty areas such as neurosurgery and plastic surgery. In 2013, Dr. Marie Crandall, then a professor in surgery/trauma care at Northwestern University, analyzed 11,744 gunshot patients from 1999-2009. The data found 4,782 people were shot more than five miles from a trauma center. Those patients were disproportionately black and less likely to be insured. Among the study’s findings: The crude mortality rate for blacks shot within five miles is 6.42 percent; whereas outside of five miles, it is 8.73 percent -- translating into 6.3 excess deaths per year. Crude mortality is not adjusted for variables such as severity of injury. Similarly, In 2011, a WBEZ analysis suggested that when it came to ambulance run times from the scene to trauma centers, there were disparities. Patients living on the Southeast Side face longer ambulance run times than other residents in the city. They have to travel an average of 50 percent longer to get from the scene of an emergency to a trauma center. Neighborhoods affected include Hyde Park, Woodlawn, Pullman, South Shore and the Southeast Side. Before these studies, the death of a young activist galvanized other young people who wanted to honor his memory and help their communities. In 2010, Damian Turner, 18, was shot near the University of Chicago. Because the hospital didn’t provide adult trauma care Turner was transported nine miles north to Northwestern’s hospital. He later died. Fearless Leading by the Youth organized around pushing U of C to reopen its trauma center. “I am so shocked that an institution with historical traces of racism has conceded all the way,” said activist Veronica Morris-Moore of Thursday’s announcement. The effort to reopen U of C’s trauma center gained additional attention last fall when the school bid for the Obama Presidential Library. In March, protesters convened at the Ritz-Carlton hotel where the university held a $4.5 billion fundraiser. And a growing coalition of increasingly powerful voices, from pastors to politicians to policymakers, threw their weight behind the effort. U.S. Rep. Bobby Rush (D-Ill.) once proposed that the federal government grant states money for trauma services. O’Keefe said the Obama library bid had nothing to do with the trauma care decision. “We actually never disagreed with the activists that the South Side of Chicago is underserved in terms of trauma services,” O’Keefe said. For the trauma center to go forward, state approval is needed and U of C will submit its application in early 2016. O’Keefe said the trauma center could open by 2018. Natalie Moore is WBEZ’s South Side Bureau reporter. nmoore@wbez.org. Follow her on Twitter.